I received both of my Fugly fabric giveaway wins in the mail! First, Jan of Janice Elaine Sews sent me this fun petunia print as well as a fat quarter of this romantic rose petal fabric! And Colby of sew. quilt. explore. sent me a gigantic bundle of this festive fruit! All or part of this will be going to the mission quilt project at my home church in Michigan that my mom coordinates. Although I kind of want to make it into a dress and put fruit in my hair. In other news, I finally decided to put a border on my snowflake quilt. So now I need to figure out what I want to do with the back of this. Which will likely take months at the rate I've been going lately. Sigh. If you're visiting from the scrap block challenge from Confessions of a Fabric Addict, welcome! 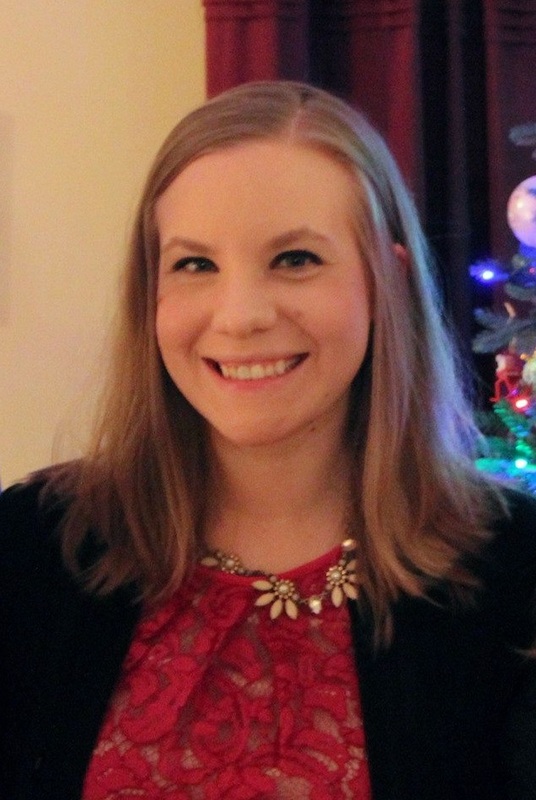 I'm Alison, a full time graduate student in chemistry by day and if I'm not sleeping, I'd like to be quilting. I've never entered a contest with my quilting and can't spend all day in front of my machine, a one block challenge was right up my alley! Thanks, Sarah! Solids are allowed and finished blocks can be any size. So I present my take on a disappearing nine patch -- garden style! For nine patch: 9-5" squares: 4 of one fabric, 4 of a second, and 1 of a third. Lay out your 9 patch as shown below, with the corners as one color, the sides another, and the center as the third. The corner blocks will be the large portion of your "petals" so keep this in mind when you make your color and layout choices. Sew together and press. Cut your sewn nine patch into half vertically and horizontally to yeild 4 blocks. On 3 of the 4 corners of your new blocks, sew your green squares along the diagonal for stitch and flip triangles. Cut your seam allowances to a quarter inch and press open. *Note: I chose to do only three corners, but you could definitely play around and do stitch and flip triangles on any combination of the corners for alternate patterns. ...but my favorite was the flower. 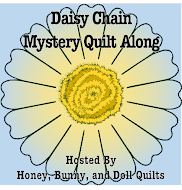 Thanks to all the new visitors and old regulars to Little Bunny Quilts! I have 3 pairs of rows sewn together on my Seville quilt and the rest is stacked neatly waiting (sort of). I wanted to get it done before Park Ranger Boyfriend was here this weekend, but that definitely did not happen. I did make some paper heart garlands for Valentine's Day a few weeks ago (found on Pinterest, inspired by here). And I also came up with a block design for Confessions of a Fabric Addict's scrap block challenge. It is very easy and I am very happy with it. So come back tomorrow morning and I will have a tutorial for my design, as well as a link to all of the other scrap block entries! 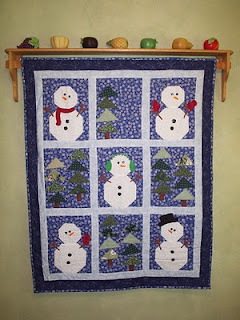 Go vote for my mom in this week's Quilting Gallery contest! Her entry is the "Snowmen (Lori)" and is SUPER CUTE. She's the one that taught me to sew, so I think she should always win. 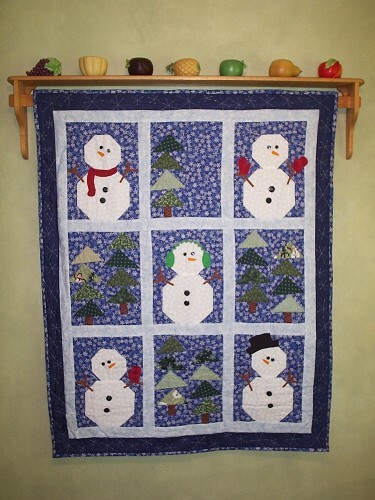 When my sister and I were younger and my mom had just made this wallhanging, we named all of the snowmen. I can't remember all of their names, but I am pretty sure their last names were all "Beauregard". So go vote. And come back later for the Friday Five.